One year ago this week, we were in the final stages of reaching a settlement with the City of Toronto that would allow us to take occupancy of our space at 32 Lisgar Street – to ensure the continuity of the organizations that make up our membership, and to begin delivering the community benefit that was promised so many years ago. We are so proud of what we accomplished here over the past 10 months. With the support of 115 incredible programming partners, the reach and impact of the exhibitions, performances and educational programs have been amplified beyond what any of us could have done alone. That’s the promise of our collaborative space and our community-centred vision of artist-run culture. As an all-volunteer team (for now! ), we devote our time and energy to TMAC because we know art and technology shapes society. We believe permanent, secure space for artists will create possibilities for new modes of civic engagement, foster community where critical work is being done now, and permanently inform culture in our city. In December 2017, three of our four members had reached the end of their leases. We were in a space crisis. There are no affordable alternatives for our organizations to continue to operate in the communities we serve. It’s the reason TMAC was conceived of decades ago, and the reason we took legal action when the City allowed the developer to default on its deal with us in 2015. For three months, our members were homeless. We were forced to pause programming and put equipment and art works into storage. It had a catastrophic effect on our operations. In February we finally reached a settlement with the City of Toronto and Urbancorp, and moved in to TMAC in March! Since then, it’s been a whirlwind of activity here as we’ve put all of our energy and resources into fulfilling this commitment to the Toronto arts community and the West Queen West neighbourhood, on top of hitting the ground running with our regular member programming, operating the facility, and working on the $2.5 million fundraising goal the City gave us. 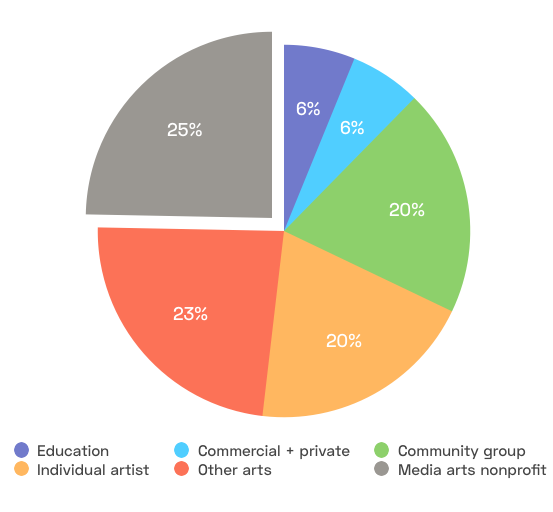 We’ve supported more than 115 partners – arts nonprofits, community groups, collectives and students – through free or subsidized access to professional exhibition facilities, event and production space. Nearly all our programs are free and open to the public. Check out all our past events and exhibitions! Before we introduce our 2019 programming, let’s take a peek back! Missed our previous update about our first month? 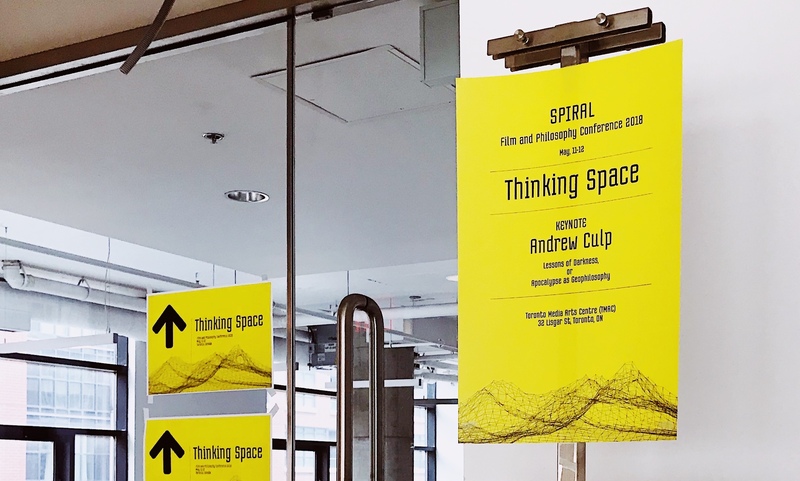 In May, Spiral Film and Philosophy Conference (York University) held two days of presentations engaging space and cinema, and a screening of short film and media works. We hosted activities for Wee Festival, a performance arts event for children, co-presented by Lisgar Park and the Theatre Centre. Lavender Menace, a panel in conjunction with the White House Studio Project exhibition by the same name, offered space for critical discussion among cultural producers and community organizers whose work lies at the intersection of art and activism. At Charles Street Video, we learned how to turn anything – including fruit! – into musical instruments in a MaKey MaKey workshop with Soundhackers + Conductive Music UK. CFMDC hosted Come Down , a 16mm screening of queer media art works in partnership with the Queer Media Database. In July, our ground-floor cafe, operated by OMG on the Park, opened to the public. Every day, neighbors drop by for a coffee and pastry, and hang out at our green picnic tables in the Gathering Space to work and catch the current exhibition. We hosted Interactive Ontario & the Cultural Human Resources Council’s Arts Futures series, the 102nd edition of the Early Monthly Segments film series, and the 9th edition of Gamma Space’s Bit Bazaar × Internet Yami-Ichi, a festival of independent games and digital art in collaboration with Our Networks. Miskeen Productions launched virgins! with a special screening and panel, to a sold-out crowd. Member workshops included Ambisonics for Facebook and YouTube, Intro to Documentary Filmmaking, Intro to Unity for Artists, Inclusive Design with Microsoft’s Bryce Johnson, Sound Recording on Location, Digital Discoverability, 360 VR and Immersive Experience Design, and many more. In August, we hosted 10 days of SummerWorks Performance Festival programming (performances, presentations, workshops and SO MUCH more in every nook and cranny!). We invited the neighborhood in for our second community open house (with guest speaker Councillor Ana Bailao), and University of Guelph MFA student Megan Moore’s ECTOPLASMS opened in Gamma Gallery. Member Dames Making Games held its second annual conference and exhibition of independent games, Damage Camp, over three days in September. Scottish artist Ruby and Toronto locals Saintfield performed to enthralled crowds in the Main Gallery. 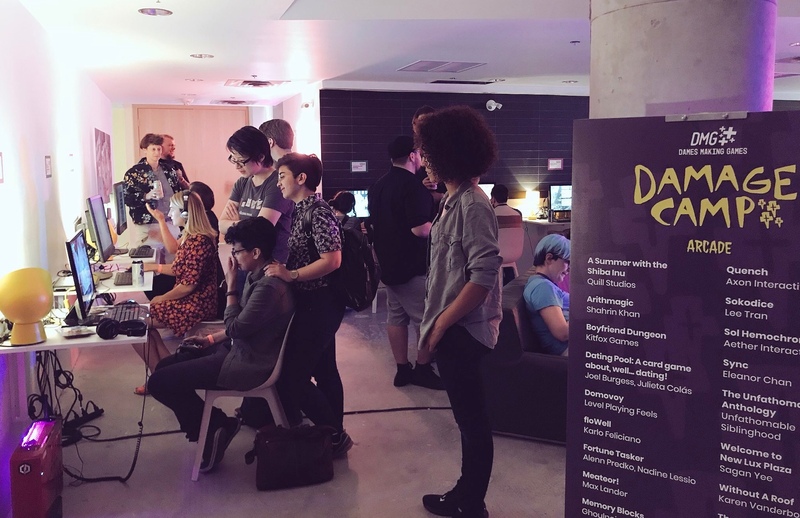 Toronto Game Jam exhibited 143 games created at the 13th annual edition of its world-renowned event. Franz Milec, a multimedia artist and filmmaker based in Prague, opened his immersive video and VR exhibition Data Science/Science Fiction in the Gamma Gallery in September. 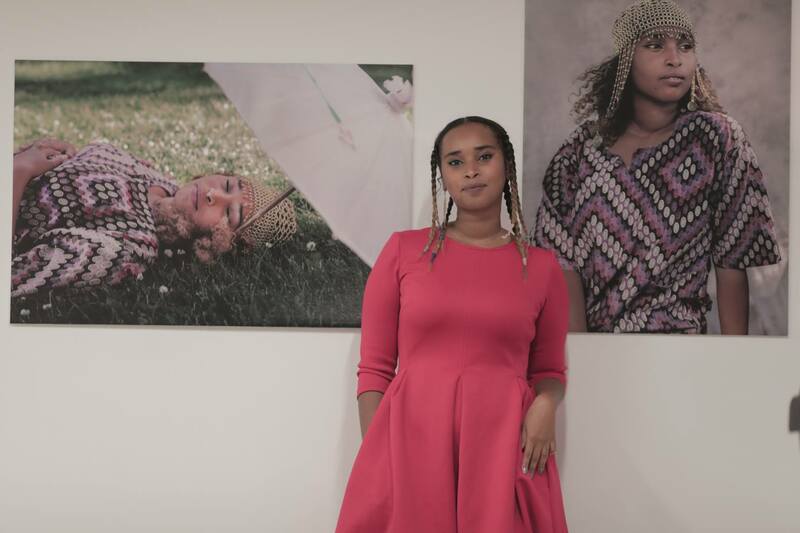 Sisterhood Media brought its traveling exhibition, where now?, exploring what Toronto and its residents truly stand to gain — and, of course, lose — in its climb to a become an internationally-recognized cultural hub. ChangeUp Art + Tech Jam partnered with each of our member orgs to unite a diverse group of over 100 artists and technologists in an intensive, collaborative three-day creation period. A public showcase and exhibition attracted over 500 attendees in one night. In October, Workman Arts presented Bursting Bubbles: Creating Context for Evolving Solitudes as part of Rendezvous with Madness Festival. The group show explored how the spaces we create can act as coping mechanisms, strategies for survival, or protective places for healing. This is Worldtown’s Unbound: Stories from Behind the Dust featured the work of Muslim, Indigenous, Black and women of colour, presenting in-depth visual stories about their communities. Workshops on the Red Dragon camera, post-production sound, cinematography, point-and-click adventure making, indie film budgeting, intro to lighting, directing actors, intro to Zbrush and more filled the calendar. aluCine Latin Film + Media Arts Festival hosted its Shorts for Shorties animated program and its dance-all-night closing fiesta. A panel, featuring TMAC programming committee volunteer and CFMDC deputy director Genne Speers, launched Worldmaking as Techné: Participatory Art, Music, and Architecture. The Media Arts Network of Ontario hosted its Toronto Media Arts Roundtable. 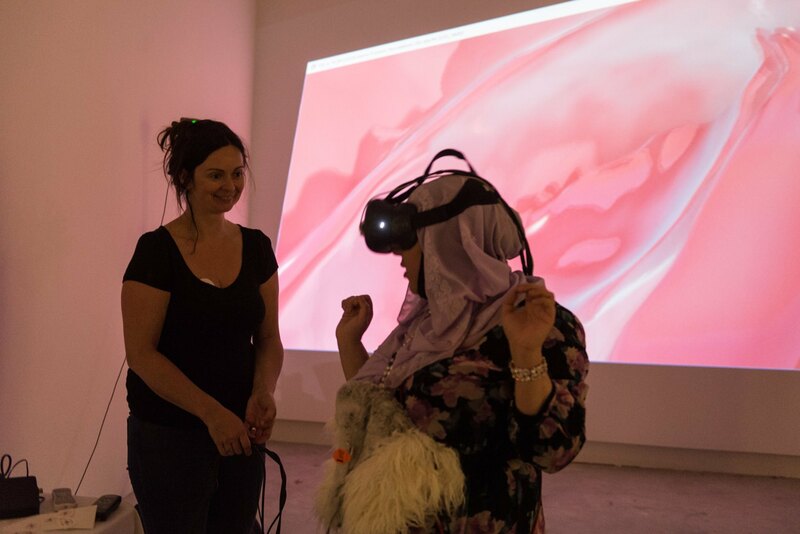 DMG teamed up with OCADU’s game:play Lab and Scatter for VVV Jam, a weekend of workshops and collaborative creation of new volumetric video art works. A community Halloween art fair took over the mezzanine and gathering space. November brought Discounted Histories , a month-long exhibition by Myseum of Toronto, in collaboration with City of Toronto Archives and the Fashion History Museum. In addition to daily gallery hours, Myseum presented 8 different free workshops and panels in a wildly popular educational program – including the sold-out Tkarón:to & Turtle Island: The Remarkable Indigenous Trade Networks with Bonnie Devine and Style + Substance with Joe Mimran and Suzanne Boyd. IntersectTO presented Race, Power, and Colonialism in Tech, a series of talks critiquing Toronto’s technology sector. The Digital Justice Lab held a data design jam, bringing together technologists, community activists, and policymakers to dream of better ways to conceive of technology and its impact. Hand Eye Society hosted a workshop in collaboration with Snapchat around its new augmented reality creation platform, Lens Studio. Make Change, an educational conference celebrating civic technologies and maker culture, hosted its third annual event on our mezzanine. Wavelength Music Series engaged its community in a facilitated consultation about building a more inclusive and sustainable organization. Fixt Point hosted a community-based initiative to connect people to the arts and their cultural heritage, with two cohorts of artists completing 2 weeks of training in audio storytelling. Access Copyright, Prescient and CARFAC Ontario presented Blockchain 101 for Artists, demystifying a technology that can be used to ensure creators are fairly compensated. Craft Ontario, our friends just across Queen Street, warmly welcomed its community on our mezzanine for its annual awards ceremony. We didn’t slow down in December, kicking off the first weekend with a VR/360 video jam in Charles Street Video; the packed Alternative Urban Futures Talk Series #1 panel and weeklong exhibition featuring projection mapping, video work and games; a Toronto Youth Food Policy Council roundtable on oppressions in the food service industry; and two community board game nights. “i am happy here, now” opened in our expansion space, featuring work by participants in the Arab Community Centre’s summer youth media arts program, co-presented with Charles Street Video. Workshop topics offered by members included intermediate Unity, documentary filmmaking, the art of the interview, creative coding for Indigenous youth, and more. Caroline Golum’s festival fave A Feast of Man screened, with a Q&A with the director and critic Adam Nayman. More than 150 people came out for Queer + Trans BIPOC Shorts Night. We’ll be announcing our winter/spring 2019 programming and new ways to get involved here very soon! Stay in the loop by subscribing to our newsletter.